Here is the circuit of a Op-Amp based Square Wave Generator. 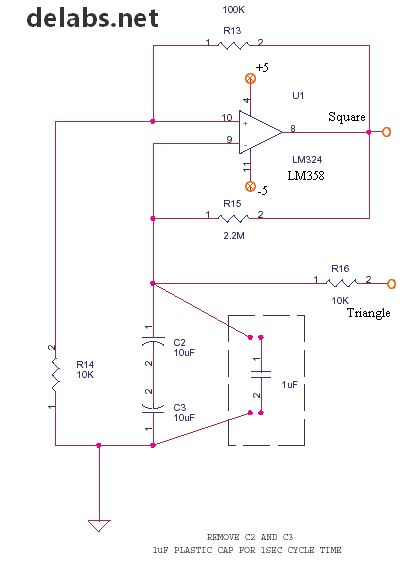 One of the main application of this is in a Simple PWM circuit and Triangle Opamp Oscillator. The Slope of the Triangle wave is compared with a DC Level to derive a pulse width or On-Time proportional to a Voltage. This On-Time proportional to voltage is for a fixed oscillation rate based on C2-C3 and R15. The C2-C3 form a Unpolarized cap, This type is also used in crossover networks in speaker boxes. This is because, a plastic 4.7 uF (2 * 10uF series) is big and costlier, but a plastic cap is very stable and closer to an ideal cap. First you need to know that most opamps in such circuits can give a square wave, but very few can swing to the rails (+/-5). For designing take 75% of Vcc. 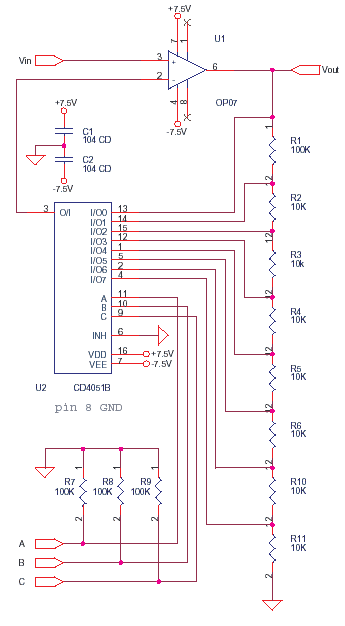 CA3130 is one that can swing to rails like a CMOS gate. Assuming the swing of output is around +/- 4V, the pin 10 + input will be at +/- 2V. When the cap is discharged at 0 V, let us take that the output is +, the cap charges to a little above +2, – input becomes dominant, so output swings negative. This discharges the cap to 0 and then charges it negatively upto -2. This in turn flips the output to + as pin 10 turns dominant. Hence this continues as a oscillation, with a nice triangle across the cap for the PWM comparator. Dominant means more +, 0 is positive compared to -2V. Also -2.5 is negative compared to -2.2. 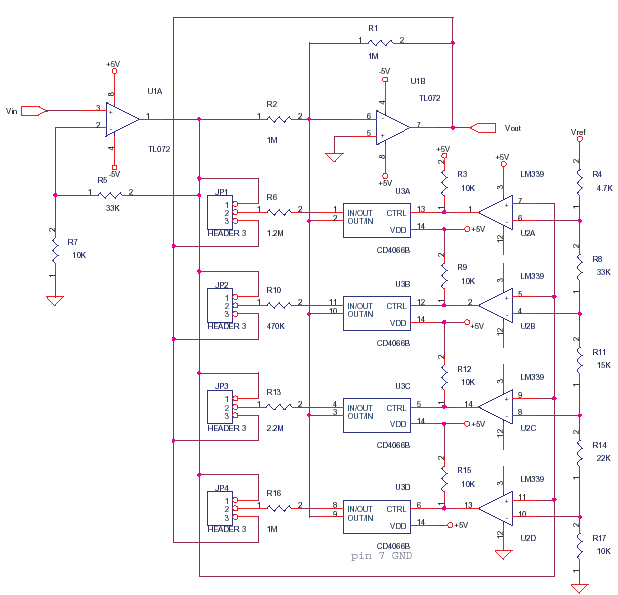 Digital gain control of Opamp. The gain of U1 can be controlled by a digital binary 1248 nibble at ABC. The gain at digital 000 is unity or 1 and the gain at various stages are set by 4051. There are eight different gains as the steps of gain resistor network is chosen by 4051. The on resistance of 4051 channel around 100E gets added to U1 pin 2 internal impedance. You can use separate resistor networks with trimpots for each channel if you require but keep the networks total burden on U1 pin 6 to around 10K, not less than than. 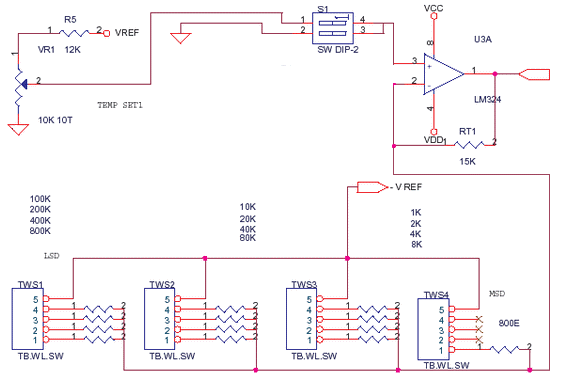 You can use this to set the gain of a amplifier with the help of a microcontroller. 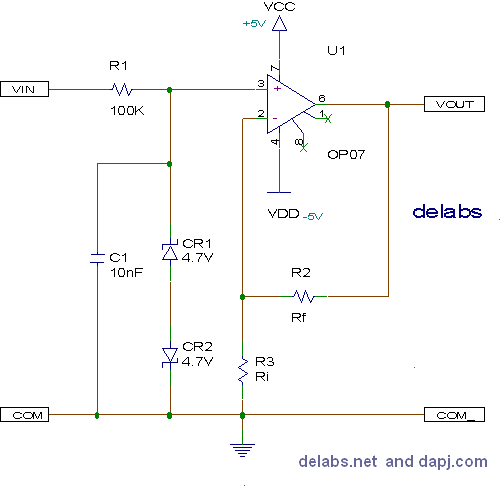 This circuit changes the gain of opamp U1B in four steps or segments. It can be used to get a linear output from most transducers to 1% levels.U1A is a amplifying buffer use it to boost the signal to the required level. The resistor values i have put are for an imaginary transducer, you have to design them. The buffered input signal is compared to reference switching points by LM339. LM339 changes the gain resistors of U1B thru the mux switch 4066. JP1 to JP4 can select either amplification or attenuation of signal. The resistor switched by 4066 can be across R1 or R2 based on JP1 to JP4. You may have to input transducer values into a spreadsheet and draw a graph. Then divide the graph into 5 segments and deduce the switch points and gain. BCD Thumbwheel Switch is used to input-set data in digital form, this can be read by digital circuits, uC and uP systems and PLC-SCADA Interfaces. In the early transition of analog to digital, before uP became acceptable, Digital systems without uP were made, it even had printers, RAM and displays. The uP systems were coming in, uC had not yet come and uP systems had to still win the confidence of the Prudent Industrial Design Engineer. The drawbacks of uP based systems used in Computers, in those days were. Power Consumption was very high, needed SMPS. Many chips, a CPU had a Retinue of many chips. Large Board, Double or Multi Sided due to Bus. Fussy, Hangs on minor Power Glitches or Resets. Needs Firmware Development and Tight Testing. Investment in all these areas, Tools and Manpower. These made Industrial Automation with uP a challenge. 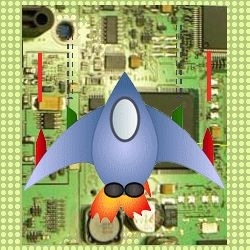 CMOS digital and mixed devices and custom application devices were more easy to implement and affordable. The coming of Low power CMOS uC changed everything and embedded systems became smaller and robust. These were packable in DIN standard and DIN Rail Mounting enclosures. Coming back to inputting digital data. CMOS uC and Ni-Cd Battery backed up RAM with keyboards made thumb-wheels and other methods less attractive for digital data inputs. Then the Li-Ion Battery, Flash Memory in Combination with Application Specific uC and SOC have made inputting, retaining digital data very easy and affordable. This LED Indicator uses a LM339, a quad comparator. LM339 can work on single or dual supplies, it has a open collector output that can drive 15mA, low power consumption. The circuit is an untested design but it should work. Mains Voltage and Power Circuits – Similar circuits for Mains Voltage Monitoring. There are many better circuits in the various circuit archives i have linked on the front page, you just have to look around. When you measure the open circuit voltage of a battery with a high impedance DMM (10M), the value may be a bit misleading. Apply a dummy load to bleed the battery a bit so that proper readings can be taken on Load. The load below is a 100 ohms wire-wound fusible ceramic resistor which will heat a bit when you test 12V batteries. R16 a 5W ceramic wire wound bleeder or dummy load. R15 is a part of an attenuator for obtaining ranges. D2 is a protection clamp diode. R10-D1 forms the 5V reference for comparators. Then an attenuator obtains 1.2, 1.4, 1.6, 1.8 V steps for each comparator. This circuit is similar to Audio Level meter or VU meter circuit. The comparator compares the battery sample voltage to the fixed reference step. If ‘+’ pin is more positive than ‘-‘, or is ‘+’ is more dominant, then output goes floating ‘open collector’, so No LED light . But if ‘-‘ is more dominant the output transistor of comparator goes low impedance or saturates or turns ‘ON’. But only spec current can be switched, do not compare with electrical switch ‘ON’. Also on a dual supply 0V is more dominant or positive compared with -12V, even though it appears -12V is a big number. The direction of current is what decides, all measurements are relative.